We’re back! As promised, here is a fun project using Tonic Studios Nuvo Pure Sheen Glitter andNuvo Glue pen on our Cherry Wood Paper. We are all about planners right now. Hopping onto the ‘planner’ movement, we created a 4″ x 8″ planner and covered it with our Cherry Wood paper. We punched a circle window in the middle of our planner cover to show a glimpse of the pages underneath. We decorated the perimeter of that window with a little Nuvo Pure Sheen Glitter. 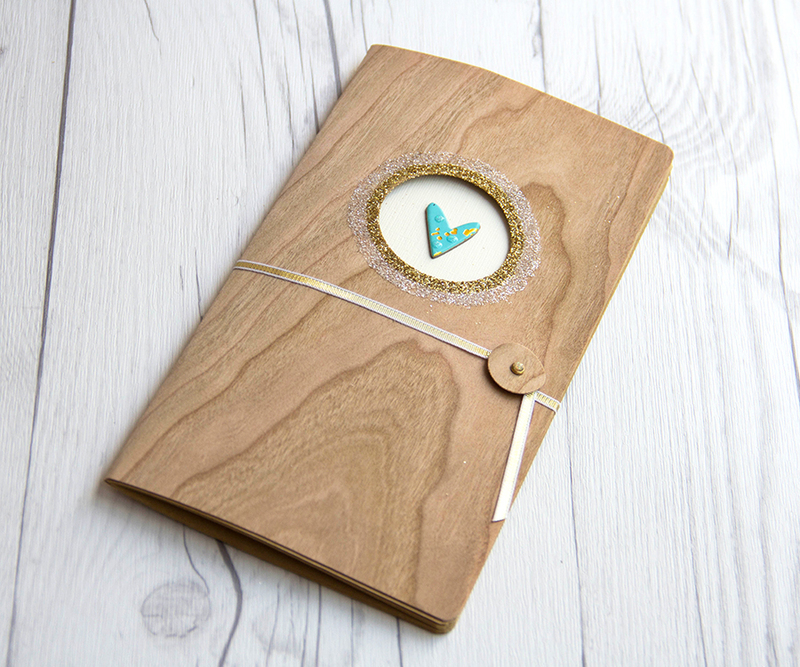 Next we added a small heart chipboard embellishment and gold ribbon to tie the planner closed. We intend on this planner getting fat with contents. How did we get that glitter so exact?! First let me tell you how awesome these Nuvo Glue pens are! Totally cool. There are two widths and the glue comes out so smoothly. We used the medium pen to write directly onto our Cherry Wood paper. The pen glides so easily across the Wood paper, and you can’t say that for many of the glue pens out there. Plus, it dries clear! Next we applied a little of the Nuvo Pure Sheen Rose Gold Glitter. You get so much glitter in these bottles and a little goes a long way. We let the glue dry and voilà, the Glitter stuck. We repeated the process to create a second ring of glitter using Nuvo Pure Sheen Diamond Glitter. Second, if you look closely at the small chipboard heart embellishment you might see a little bit of Nuvo White Blizzard Glitter Crystal Drops. Yes, the Nuvo Crystal drops come in glitter finishes too! Lastly, check out that fabulous Cherry Wood grain! Every sheet of our wood paper is totally unique, giving you one of a kind results every time. We have more inspiration to share later this week! Stop back to see a couple more projects using Tonic Studios Dies. See you soon. Follow our friends at Tonic Studio on their Blog, Facebook, Twitter, Pinterest and Instagram. This entry was posted in Crafts & Kits, DIY Projects, Journals and tagged glitter, journals, Nuvo, planner, tonic studios.